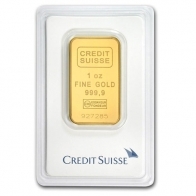 Buy Credit Suisse gold bars from SwissBullion.ch. All Credit Suisse gold bars are manufactured by Valcambi on behalf of the bank. Credit Suisse is the most prominent Swiss bank in the precious metals market, and their bars are hugely popular worldwide. 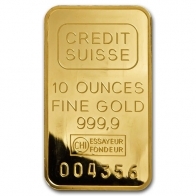 The most popular sized Credit Suisse gold bars are 1 Ounce and 10 Ounce sizes. All bars are 24-karat gold bullion. Credit Suisse gold bars may be purchased using Bitcoins, Altcoins, EUR, CHF, USD and GBP, and may be stored tax-free in Zurich or requested for delivery.